Nose Graze — Young Adult book reviews2.5 StarsI'm sad to say that Fractured has so many typical elements of a second book in a series. The plot isn't that fast moving, I found myself very unsure of where it was headed, and there were problems with the once awesome romance. In Fractured it's all about patrolling the area for Mazikin, but it feels like they just patrol day after day without any results. That makes the plot feel quite slow at times. And, most frustratingly, there are relationship problems.One of the reasons why I fell in love with Sanctum so much was because of the romance, but it barely existed in Fractured. Lela and Malachi take some "time apart" so for most of the book their relationship is awkward and tense, since they're not really "together". He starts hanging out with another girl and Lela starts hanging out with another guy, and there's a bit of jealousy there... it was just disappointing. Throwing an unnecessary wrench into the romance is so typical in second books and I was a little heartbroken to see it happen in Fractured.There were some interesting new characters in Fractured and the ending was pretty crazy/intense/unexpected, but it wasn't really enough for me to be able to say I loved (or even really liked) the book. Fractured wasn't horrible, I just felt very little for it. Sanctum made me feel ALL THE FEELS, but I felt like there were very little feels in Fractured. Even when devastating things happened, I didn't feel them. I was kind of indifferent the entire time.So overall I'm pretty bummed. Part of me is honestly wondering if my lack of love for this book is because I wasn't that in the mood for a supernatural/demon/paranormal book.. but at the same time, I think I can pretty objectively say that there were a lot of unenjoyable elements in the book that are so common in disappointing second books (particularly the problem with the romance). 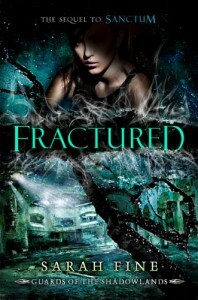 But Fractured did end on an interesting note and I am really curious to see how the third book plays out!